Honestly, I wasn't expecting much. I was concerned about the amount of lobster that would be in the rolls. I was happily surprised. The order comes with two small rolls stuffed with the lobster. There was no mistaking it because the tell-tale pieces of lobster claw were thrusting out the sides. The dressing was a thin mayo base seasoned with dill and other spices that had good flavor. On the side was a pile of house-made potato chips. If I was eating at the restaurant I'd be going for a bigger entree. 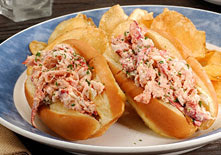 But for a to-go item with little fuss, the lobster rolls were a good call. On Second Saturday I showed up at the location where the new Drewski's Hot Rod truck was set to debut. After a late start, I was one of the first in line to try one of their sandwiches. More than a grilled cheese truck, their sandwiches add such things as pulled pork and Korean short rib to the mix to make a stepped up grilled cheese experience. I ordered the Mustang - Braised Korean boneless beef short rib, house-made Kimchi, crispy daikon strings, melted havarti cheese and Saracha / wasabi aoli grilled on brioche bread. It was yummy, but could use a couple of tweaks. And since they are just starting out, hopefully they will be looked into. First was the fact that the sandwich lacked any Asian-ness to it. The Korean short rib didn't taste Korean at all, but just like any old braised short rib. The kimchi was also lacking kick. Kimchi, as far I'm concerned, should have a bit of bite and heat to it. This was merely pickled cabbage. Was there Saracha/wasabi on it? I couldn't tell. Lastly, double the cheese. If they take those comments to heart and change it up a bit, this sandwich will move from good to outstanding. I have not been to the Grilled Cheese Truck in Los Angeles. I've just heard plenty about them and seen them on food truck shows on TV. Their signature sandwich has pulled pork and mac n cheese. I decided to try and duplicate it at home. It should be noted that Drewski's is calling their version of it The Hemi. 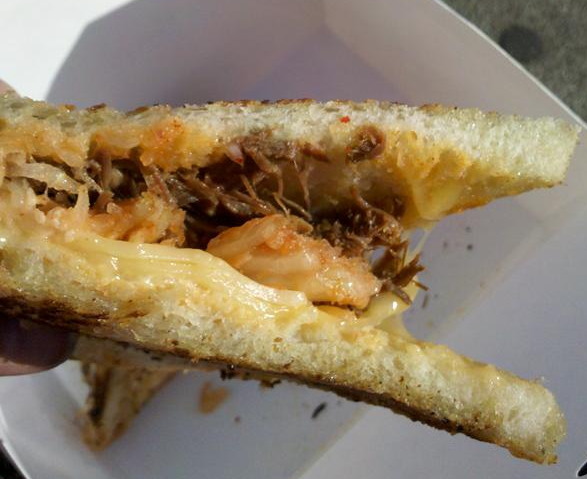 Basically the GC Truck's sandwich is: bread, cheese, mac n cheese, pulled pork, grilled onions, cheese, bread. They should name it the Cardiac Arrest Sandwich. Well one day the fates aligned. I had recently made both pulled pork and onion jam. Then I went to El Pollo Loco and had leftover mac n cheese. I had all the ingredients, why not make the sandwich? I got my trusty George Forman out and grilled away. The result was the sandwich above and a happy tummy. I hadn't been too sure about the mac n cheese in there, but found that it all mashed together just fine. The drawback is, how often do the fates align like that. Most of the time you would be required to make all those elements. 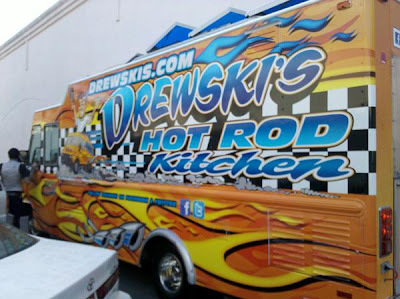 I think I'll save myself the trouble and let Drewski's do it for me.